When Will Paige Pierce Break 1000? Paige Pierce was dominant at the Jonesboro Open, winning by 10 strokes. This is not too surprising considering that she won the Memorial Championship by 11 strokes and that was the result of great play from tee to green. Also, we cannot forget that she won in Vegas and WACO, as well, albeit by smaller margins. 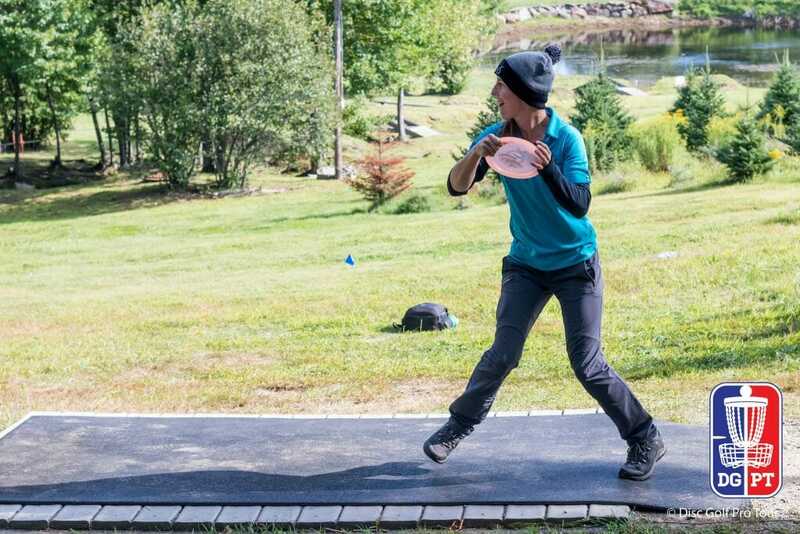 Her dominant play this season and last, further exemplified by her most recent PDGA rating being the highest ever achieved by a woman, begs the speculative question: when will Paige Pierce’s rating break 1000? Which leads to a more practical question: can we predict when? Pierce has said reaching 1000 is one of her major career goals, and she knows it will be some time before she does, in part because of the PDGA’s process of updating ratings. But I wanted to get at a more concrete prediction: my best guess is August 2022. 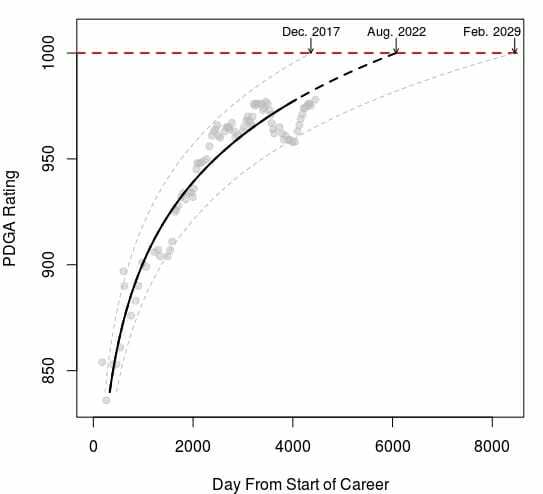 To get to my prediction of August 2022, I took all of Pierce’s ratings, from her first one in June of 2006 (854) to her most recent one in March (978), and estimated the line that best describes how her rating has changed over the years.1 Then, basically, I extended the best fit line to determine which date her rating is expected to reach 1000,2 and that date is August 2022. Of course, there is error in this estimate,3 so I included the 90% prediction values in the plot, as well. In other words, there is a 90% chance that the date Pierce’s rating reaches 1000 will fall between December 2017 and February 2029. By 2029, Pierce will be 38 years old, which is more or less the age when those comparable players started to decline. As age increases, generally, that makes it less likely that she (or any sub-1000 rated disc golfer, really) will reach the coveted four-digit rating. So, no pressure Paige, but it is a race against the clock; the disc golf world is rooting for you to make history. Comments on "When Will Paige Pierce Break 1000?"